This blog will describe ‘adventures with mistletoe’ in the run-up to Christmas 2004. 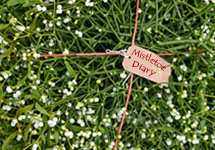 The blog is by Jonathan Briggs, a mistletoe enthusiast, who will be undertaking several mistletoe, er, events during November and December. For background info see his website at www.mistletoe.org.uk. This 2004 blog is a follow-up to to Jonathan’s trial mistletoe 2003 blog – which is available from the website – go to www.mistletoe.org.uk and click on weblog.